When will be Joanna Lumley's India next episode air date? 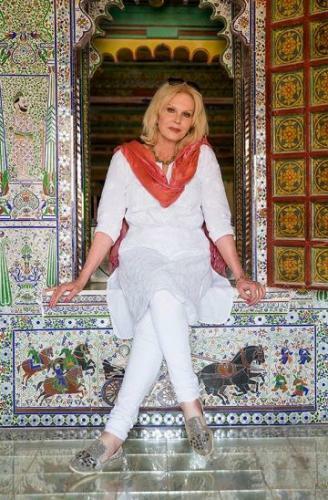 Is Joanna Lumley's India renewed or cancelled? Where to countdown Joanna Lumley's India air dates? Is Joanna Lumley's India worth watching? Joanna Lumley returns to the country of her birth for a deeply personal journey around the vibrant and unique country of India. She was born during the last days of the Raj and both sides of her family called India home, for several generations. In this series she travels the length and breadth of the country, for an immersive and extraordinary exploration of its diverse landscapes, varying cultural traditions and incomparable spirit. Along the way, she meets an eclectic mix of people and discovers how independence has shaped India into the constantly evolving and endlessly fascinating country it is today. In this episode, Joanna witnesses religious ceremonies in glorious temples; learns how scientists are enabling people in tea plantations to live alongside wild elephants and with the help of computers is turned into a multi-limbed indian goddess. In Kolkata Joanna takes to the streets at night with a local guide and meets some members of India's transgender community. Finally Joanna journeys high into the Himalaya's to visit Gangtok in Sikkim where her mother lived as a child, and so holds a strong family connection for Joanna. Joanna's final leg of her journey through India takes her first to Ranthambhore National Park, where she hopes to spot a tiger in the wild. Joanna's next stop is the mighty city of Delhi. She begins her exploration of the capital at Humayun's Tomb - a place that has a very personal family connection for her. She visits a community of 10,000 homeless men living under a flyover, where a basic cinema offers some much-needed escapism. Then, in stark contrast, she tries her hand at working in a hi-tech call centre in a smart new area of the city. Moving north from Delhi, Joanna travels to Dharamsala, where she is granted a private audience with His Holiness the Dalai Lama, before finishing her incredible 5,000 mile journey by revisiting the place where she was born - Srinagar in Kashmir. In episode three, Joanna's adventures across India conclude as she explores Rajasthan, Delhi and the mountainous North West ending in Kashmir, the place of her birth. Joanna Lumley's India next episode air date provides TVMaze for you. EpisoDate.com is your TV show guide to Countdown Joanna Lumley's India Episode Air Dates and to stay in touch with Joanna Lumley's India next episode Air Date and your others favorite TV Shows. Add the shows you like to a "Watchlist" and let the site take it from there.